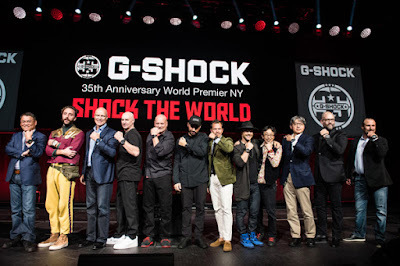 G-SHOCK kicked off its yearlong 35th anniversary celebration with an exclusive press conference and live performances by DJ and founder of streetwear brand Off-White Virgil Abloh and headliners A$AP Mob at The Theater at Madison Square Garden in New York City. The celebratory event offered G-SHOCK executives and friends the opportunity to honor the brand's legacy, recapping 35 years of innovation and sharing exciting future plans. The evening began with David Johnson, Vice President of the Timepiece Division for Casio America, leading a press conference that featured G-SHOCK executives speaking to an audience of over 1,300 attendees regarding the evolution of the brand. President of Casio Computer, Mr. Kazuo Kashiooffered a retrospective of Casio's rich legacy, while Founding Father of G-SHOCK, Mr. Kikuo Ibeunveiled the first-ever, sapphire crystal G-SHOCK – a prototype model fusing the most fragile material with G-SHOCK's hallmark toughness. Also revealed at the celebratory event was the newest timepiece from the namesake Master of G line, a solar GPS navigation Rangeman. Equipped with GPS capability, triple sensor and low-temperature resistance, this new solar-powered model connects to the G-SHOCK app to allow 3D log mapping to route the wearer's every adventure. Executive Managing Officer, Mr. Shigenori Itoh led the test of toughness for the evening alongside Hockey Hall of Fame member and former General Manager of the New York Rangers Mark Messier, who recreated the iconic first G-SHOCK commercial through an epic display of shooting watches into a hockey net in place of a puck. G-SHOCK Athlete, Louie Vito, RedBar Group Founder Adam Craniotes, Author and Condé Nast Traveler Editor, Matt Hranek, KITH Owner, Ronnie Fieg and other friends of the brand also joined executives onstage to discuss the growth of G-SHOCK as a leader in timepiece innovation. On display throughout The Theater were key timepieces representing all of G-SHOCK's collections, including MR-G, MT-G, Master of G and women's S Series. Custom artwork included hand-painted pieces by artist and longtime collaborator, Eric Haze, who designed the celebratory logo and identity for the 35th anniversary. Haze has worked with the brand for over 20 years, and also designed the official logos for the 25th and 30th anniversary celebrations as well as signature models. The news conference was followed by a cocktail hour with music by DJ and Founder of streetwear brand Off-White, Virgil Abloh, with the evening concluding with an exciting, energy-filled performance from A$AP Ferg alongside other A$AP Mob members, including A$AP Ant, Cozy Boys, A$AP Nast and A$AP Twelvyy. Celebrities, actors and influencers such as Grammy-Award winner recording artist T-Pain, acclaimed grime artist Skepta, Designer Nicole Miller, Model and son of P. Diddy Christian Combs and tattoo artist Jon Boy, as well as G-SHOCK athlete and Olympian Louie Vito also attended the milestone event.